Alcoholism aftercare treatment is a stage of healing where all lessons learned during rehabilitation comes into play when an addict comes home from rehab. Against popular belief, recovery from alcoholism doesn’t just end with rehab. Coping with environmental pressures or peer pressure can be pretty tough. While several people triumph over these pressures, many others relapse. Hence, alcoholism aftercare sets the stage for a healthy life free of alcohol. What is aftercare after alcoholism treatment? What are the types of aftercare treatment? What is the aftercare for the family of the addict? How to develop an aftercare plan after rehab? What happens if there is a relapse during the aftercare? Alcoholism aftercare treatment is a program that helps the reformed addict to maintain life-changing skills learned during rehabilitation. Aftercare treatment is a program that would help the recovering addict know what to expect in the first year of sobriety. While there are different types of alcoholism treatments like smart recovery and others, having a drug and alcohol aftercare plan comes in handy; it helps the reformed addict to maintain a healthy addiction recovery and a positive path that is sustainable after alcohol is removed from the body. As earlier stated, the process of alcohol recovery aftercare begins the moment the rehabilitation process commences. However, during the alcohol rehabilitation process, a relationship bond is expected to have been formed between both parties(Counsel and addict). This ensures a smooth alcohol aftercare plan where counseling becomes easy. Counsels are guides which serve as a compass to ensure recovery is sustained. Additionally, they provide clues on the do’s and don’t during alcohol aftercare treatment as well as bring to constant remembrance the limits and boundaries to achieve sustained growth. Alcohol addiction is a behavioral disorder capable of breaking the bonds of trust and honesty. Patients may completely lose out on the family’s trust and loyalty. Family Education and Counseling is a form of alcoholism aftercare that helps to mend the broken ties and restore the needed trust. This is done by a profound education of the family members or loved ones as well as a call for their needed support to ensure that the revered personality does not relapse. There is a possibility of an educational program for the spouse, children, friends, relatives of the newly recovered patient. While this appears to be key to the alcohol rehab period, it is a type of alcoholism aftercare that is greatly needed as the reformed addict prepares to fuse with the community properly. The case manager provides guidance in finding an association of people with equal desires within the community. Case manager could also be of great help in providing legal assistance as the addict continue the quest to sustain growth and recovery. When an addict comes home from rehab, the attention shifts swiftly to what to expect after rehab. Another question that strikes the mind is how to stay sober after rehab. Transitioning is quite difficult for a handful of people. Sober Living homes are out to curb occurrences like this and also provide a well secured and stable environment similar to that of the therapy clinic. The family of the recovering addict receives one-on-one counseling from the therapist where the emotional, physical support for the addict is spelled out. The family of the recovering addict hooks up with family members of addicts to learn detailed information on how to sustain the recovery process of the addict. This Involves information on how to prevent and manage trigger as well as how the family members such as a spouse, kids are affected by the addiction. This is an educative program where case management, adaptation, and adjustment are taught. The alcohol history of the family is checked, and each member of the family knows their strengths and weaknesses. The completion of therapy does not signify the end of the recovery process. An aftercare plan is needed. Developing an alcohol recovery plan is a long thought that should begin the moment alcoholism recovery treatment begins at the rehabilitation center for alcoholics. Research has shown that there are two possible outcomes after alcohol rehab; A handful of people fitting perfectly back into the society, or several others who experience a relapse. Always stay busy with some activity. Additionally, the development of alcoholism treatment aftercare plan involves the creation of a prevention plan which would subsequently help to prevent cravings and shut trigger. Relapse prevention plan could either be Gorski Model or the Marlatt’s model of relapse prevention. Assessment: Involves the identification of triggers as well as checking alcohol history. Relapse Education: Information involving relapse are well detailed coupled with what to expect in the first year of sobriety. Warning Signal Identification: Involves the identification of triggers and possible causes of craving. Recovery plan: Involves meeting with a therapist who provides guides on how to prevent possible relapse. Inventory Training: Guides on how to avoid high-risk situations are given here. Family Education: Family is not left out in the training as psych education are equally dome for the family on how to provide the needed support during the recovery period. If relapse occurs during alcohol addiction aftercare, counseling and therapy are also vital mediums that could help restore the addicted patient back on track. According to the National Institute on Drug Abuse, there is a 40 to 60% occurrence of recovering addicts experiencing a relapse. During the rehabilitation period, addicts discover the importance of sobriety and ways to resist relapse after alcohol rehab are equally taught in sobriety living homes. Recovering patients should also have a plan on how to overcome or defeat cravings. Defeating cravings which trigger relapse involve having a planned coping strategy which would curb the emotional, physical or mental trigger factors. Additionally, a prevention relapse plan would be helpful to help curb future relapse occurrence. The prevention plan could either follow the Gorski or Marlatt’s model of relapse prevention both of which are effective. A life without alcohol is also fun. Alcoholism can be defeated, all lessons learned during rehabilitation and patterned habits can be broken. Knowing how to treat alcoholism is not always enough to achieve the complete recovery. 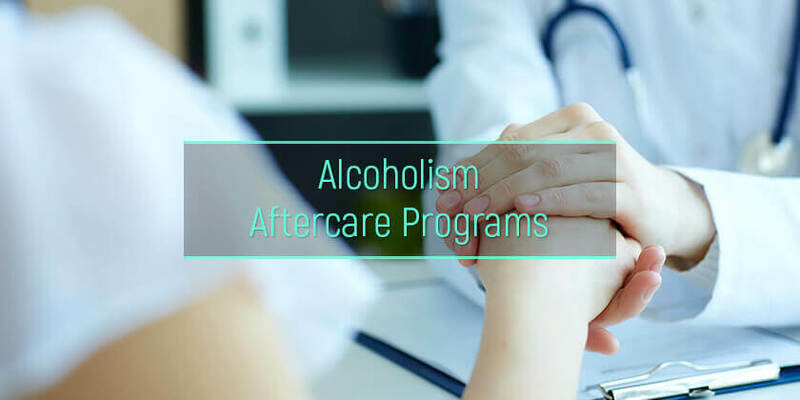 Going through any of the various types of drug and alcohol aftercare programs is effective and has been applauded majorly for its ability to help triumph over the numerous life after alcohol challenges people face.